AlpLocal Local Mobile Advertising | Alphabet Local - Your Mobile Ads Leader! 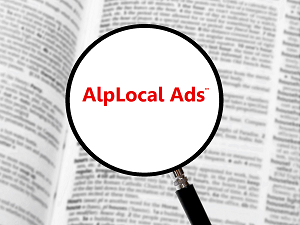 AlpLocal Local Mobile Advertising offers the business building tools needed to grow your online business and connect with new and existing customers or clients. Alp means a high mountain. AlpLocal means Local Businesses can become as high as a mountain in their communities … rise above the competition and be found on mobile … fast! AlpLocal provides the online tools to effectively market local businesses. Look at what AlpLocal can do for your business. AlpLocal brand-building mobile advertising will elevate your brand, promote your website, lift brand awareness, build your audience and build your brand in local searches. Our local mobile ads can be used for online advertising, product promotions, monetize brand highlights, drive ad engagement while connecting your business with customers. Your use of AlpLocal Local Mobile Advertising will create meaningful exposure as well as customer engagement, boost profitable leads and connects with the right customers. Make AlpLocal Mobile Advertising a part of your easy to use marketing plan as you laser-target the right audience for your products or services. Get local exposure … Become an AlpLocal Advertiser … Today!